Kenaz Filan, author of The Haitian Vodou Handbook and books on related topics, presents here a magical gumbo mix of history, mystery and lore that shouldn’t be missed. 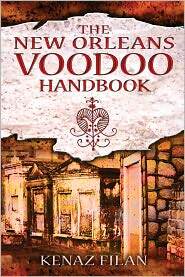 New Orleans voodoo isn’t simply Santeria or Yoruba moved to the mainland. It’s a unique, regional matrix of spiritual practices that’s developed over two and a half centuries. Waves of multi-cultural immigration, politics, wars, and a polyglot of religious influences have been blended together in a raggle-taggle fashion with bits of Yoruba and Santeria. The first part of the book provides historical information on New Orleans, all the way from the discovery of the Mississippi delta by European adventurers to Hurricane Katrina and its aftermath. It’s essential to understand the different events that shaped the development of New Orleans, as these historic layers help the reader appreciate the complexity and diversity that led to the current conglomeration that is New Orleans voodoo. Part II focuses on the spirits, saints, and lwa that are honored in New Orleans traditions. Here Filan’s grasp of the regional diversity shines—for example, the Old Man at the Crossroads may be identified as Papa La-Bas (Paper Over-There), or as Papa Legba, Ellegua, Papa Limba, Liba, or Laba, or in an alternative form as Saint Peter or perhaps Saint Lazarus. The author reveals the complex of identities for each deity, along with prayers, tips for appropriate candle colors, and favored gifts for attracting aid. A practitioner can choose the aspect of a deity that suits his or her preferences and ideological bias to obtain a particular result or effect. There is an overview of typical magical methods employed in New Orleans, including candle spells and the different sizes and shapes of candles available for various purposes, oils, spirit dolls and mojo hands (aka gris-gris bags), and assorted divination methods. A listing of shops and sites is provided for the magical tourist. There’s also some stories about people who relocated to New Orleans and the mixed, sometimes extreme effects, that New Orleans can have on people. This is not a salubrious environment for everyone. As more Latinos are entering the city seeking employment in the reconstruction process, a fresh influx of Santeria and Yoruba appears to be entering this grand old city. There are useful Appendices supplying a list of New Orleans musicians, a list of movies and books about New Orleans, endnotes, and a comprehensive index. There is also an Afterword about the effects of the Deepwater Horizon spill. Well researched, well written, and a delight to read, I highly recommend this to readers who want to understand how and why New Orleans voodoo is different from the island varieties. This is a good primer on the spirits and local practices. It’s also a wonderful starting point if you’re planning to travel to NOLA in the near future and want to visit the cosmic high spots. Great job, Kenaz!